The repayable contribution will be provided through the Atlantic Canada Opportunities Agency (ACOA)’s Business Development Program. Growth-oriented companies can leverage up to 75% coverage of project costs with to help expand and modernize their business. The program offers interest-free small business loans to help accelerate economic growth and development across Atlantic Canada. Access to capital will help the manufacturer deliver new products, be well-positioned for growth in export markets, and create 14 full-time jobs at its facility in New Brunswick. Family-owned food manufacturer, Covered Bridge Potato Chip Company, specializes in dark Russet chips and popcorn. The company was established in 2009 as a three-man operation in Hartland, New Brunswick. Since then, the business has grown to nearly 100 employees and its products can be found world-wide. The company has been awarded $437,500 in repayable funding through the Business Development Program, which supports small and medium-sized companies across Atlantic Canada. Federal funding will help offset the cost of purchasing new equipment such as, conveyors, sorters, kettles, and a packaging machine. These assets will allow the company to offer an all-natural, gluten-free line of kettle cooked popcorn. This project is the second phase of a facility expansion the company undertook in January 2017. The 9,000 sq. ft. expansion has helped the company increase production and improve efficiencies, which in turn has allowed the business to boost its export capacity. Businesses in Atlantic Canada can benefit from a range of funding programs that support strategic projects, including business expansion, hiring and training, research and development, and capital investment. Programs, such as the Business Development Program, can be leveraged to accelerate timelines, maximize project outcomes, and increase return-on-investment. Government grants and loans are widely available for businesses in Nova Scotia, New Brunswick, Newfoundland, and Prince Edward Island. Small and medium-sized businesses across Canada can access a range of government funding programs for manufacturing projects. However, to get started, business owners and executives need to know where to look for funding opportunities. 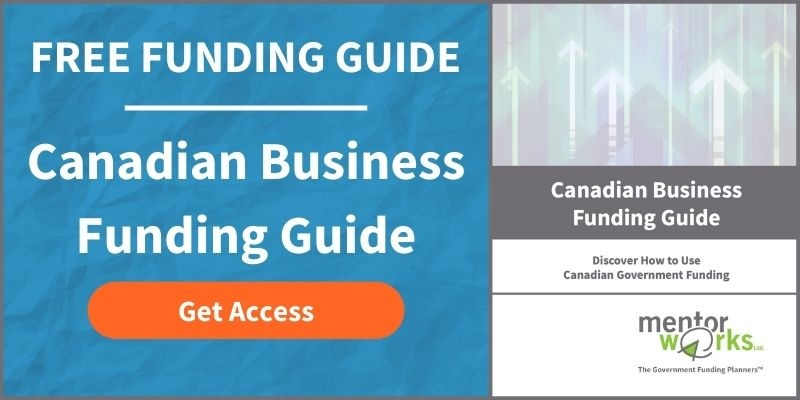 Businesses can explore the types of funding, funding sources, timelines, and how to prepare an application by downloading Mentor Works’ Canadian Small Business Funding Guide.